To the east of Kuala Lumpur is the Titiwangsa Range. Essentially the backbone of the Malaysian peninsula. The city is relatively hilly. If you want some serious climbing, you don’t have to go far. The golf course I rode to yesterday is highlighted in yellow. As you can see, it is on the eastern edge of the city. Bordering on forested hills. 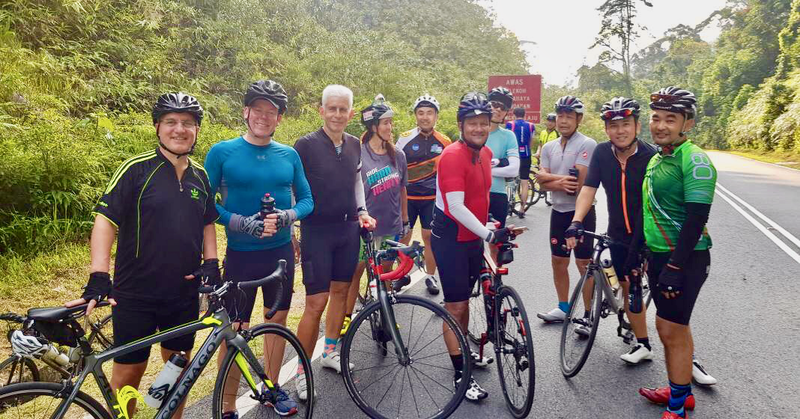 Today’s ride started at Nam Wah kopitiam. A kopitiam or kopi tiam is a traditional coffee shop found in Southeast Asia. The word kopi is a Malay/Hokkien term for coffee and tiam is the Hokkien/Hakka term for shop. 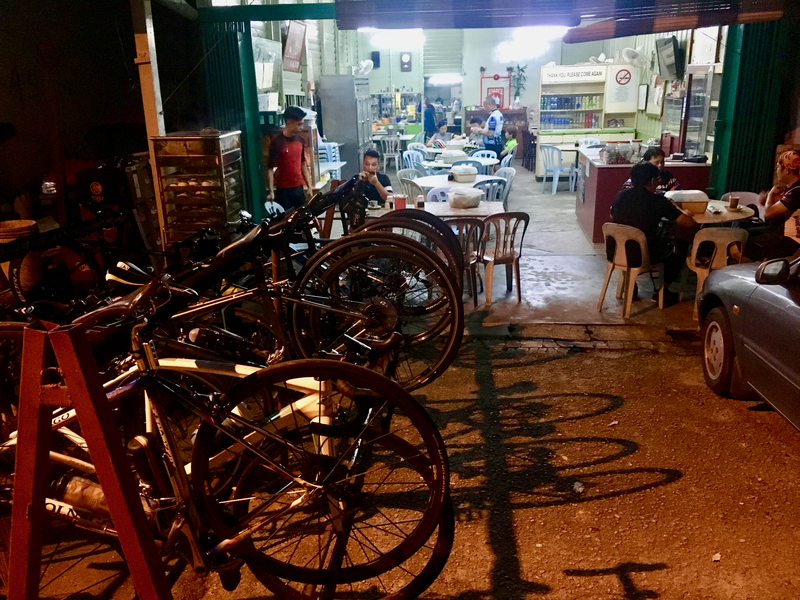 Not only is Nam Wah open at 6.00am to cater to the early starters, there are bike racks too. Bike racks are not common in Kuala Lumpur. 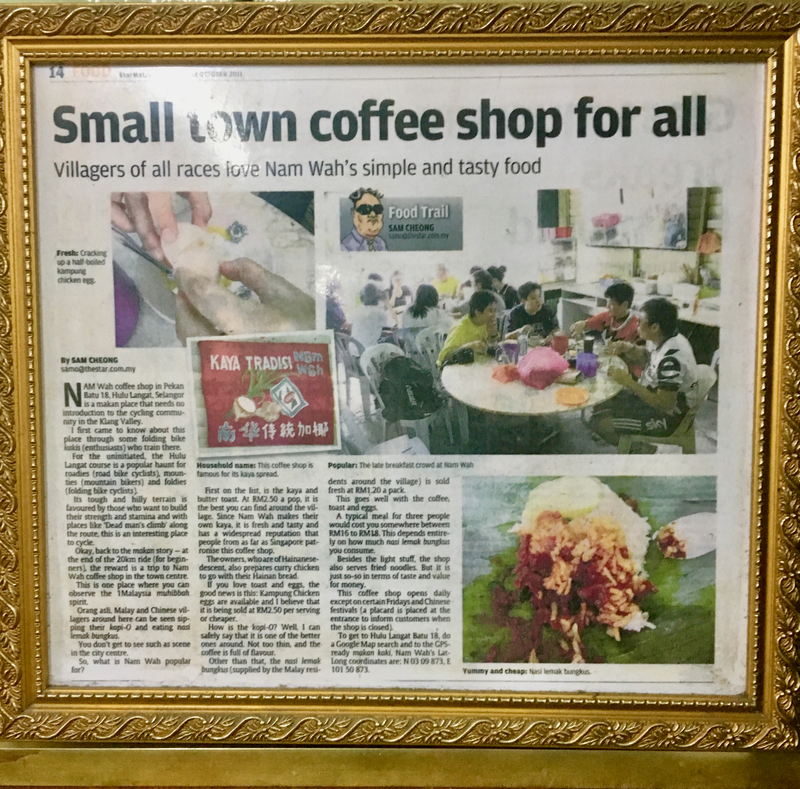 A newspaper cutting of a story on Nam Wah hangs behind the payment counter. The plan had been to start riding at 7.15am. An organized trail run nearby that we didn’t know about meant that there was a traffic jam getting to Nam Wah. So it wasn’t until about 8.45am that coffees and Milos were out of the way, and we were ready to roll across this river and start riding. There is an eleven kilometre warm up before the climb proper, which starts as soon as you turn left at the T-junction. From there it is 9.6 kilometres and 500 metres of elevation to the summit. It isn’t long before you are above the morning mist in the valley. The road up to the summit was very quiet this morning, with more bicycles than motor vehicles. 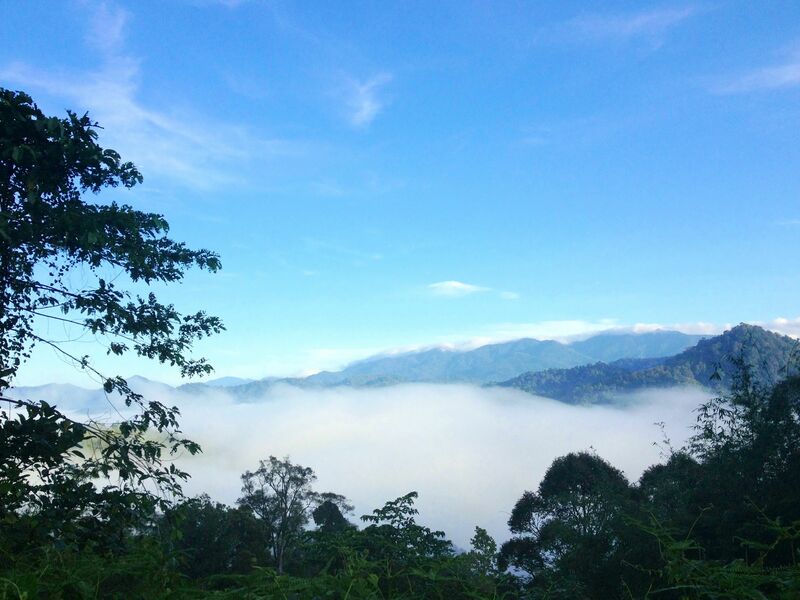 The border between the states of Selangor and Negeri Sembilan passes through the high point of this climb. There is a sign welcoming you to the state of Negeri Sembilan as you cross the border on your way up the last few metres to the summit. 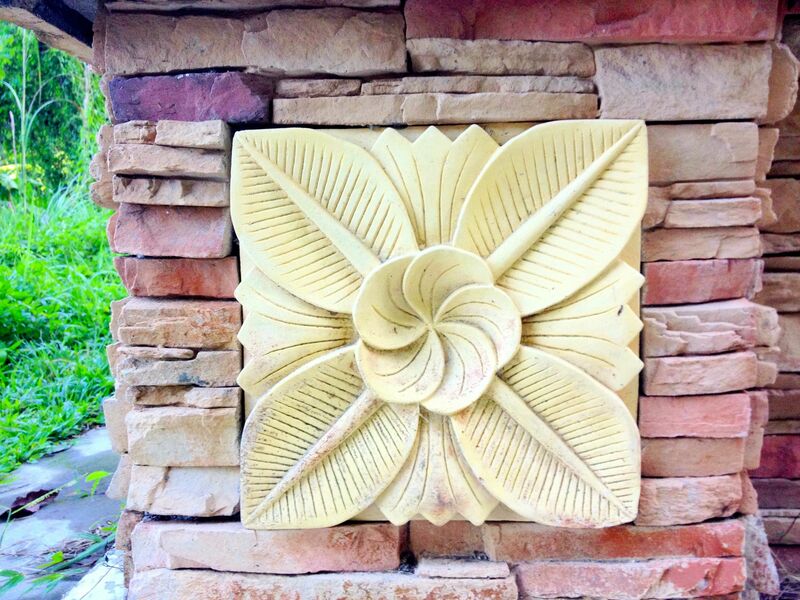 The sign itself is pretty bog-standard, but it does have a nice detail on the stone frame. Naturally, there was a group photograph at the top of the climb. Then came the payoff. Blasting back down the hill. At the T-junction we turned left toward the Semenyih Dam. 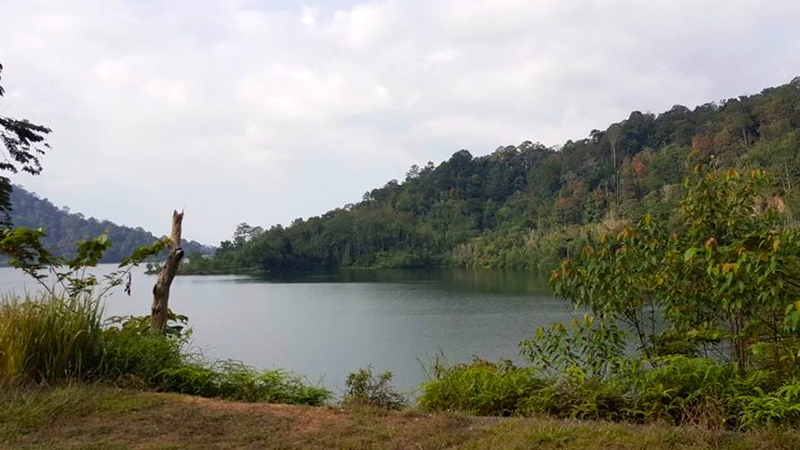 We rode along the western shore of the lake before retracing our tracks back to Nam Wah for breakfast. Let me decode this morning’s contribution to the local economy. In the bottles and glass mugs is barley water. Made by boiling pearl barley. Unlike the British version, the strained grain is included within the drink in South-East Asia. In each red plastic mug is boiling hot water and two eggs. Each person times how long they want their eggs to cook. Three minutes for me, which produces a very soft-boiled egg. You use the teaspoon to scoop the egg out of the shell and into the bowl. In the background is a bottle of thin soy sauce, which is used in lieu of salt. There is a pepper shaker out of shot. Hidden behind the bottle of barley water on the right is a packet of nasi lemak. This is a fragrant rice dish cooked in coconut milk and pandan (screwpine) leaf. There are many variations of this dish, which many consider the national dish of Malaysia. In the classic version, the rice is served with half a hard boiled egg, ikan bilis (fried anchovies), peanuts, and some sambal (a chili paste, often containing squid). Traditionally it comes to the table wrapped in a banana leaf and newspaper. In the plastic tub is kaya (coconut jam). It is made from a base of coconut milk, eggs, and sugar. Nam Wah makes their own kaya. It is some of the best around. This tub came home with me. You may have noticed the price tag on the kaya. RM3.80 : AUD1.25 : USD1.00. It was the most expensive thing on the table. 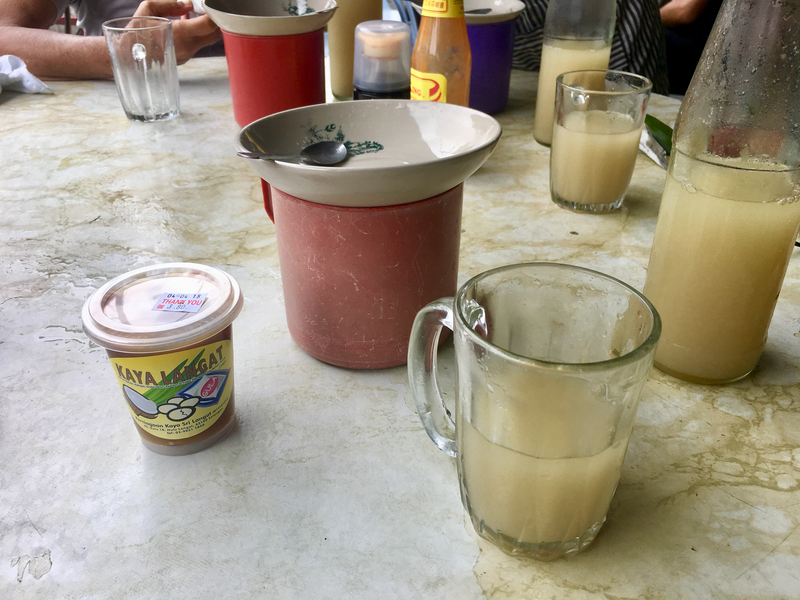 Also on the table were eight eggs, two packets of nasi lemak, and four bottles of barley water. The bill came to RM21 : AUD7.0 : USD5.40. Now if only bicycle components were that cheap! 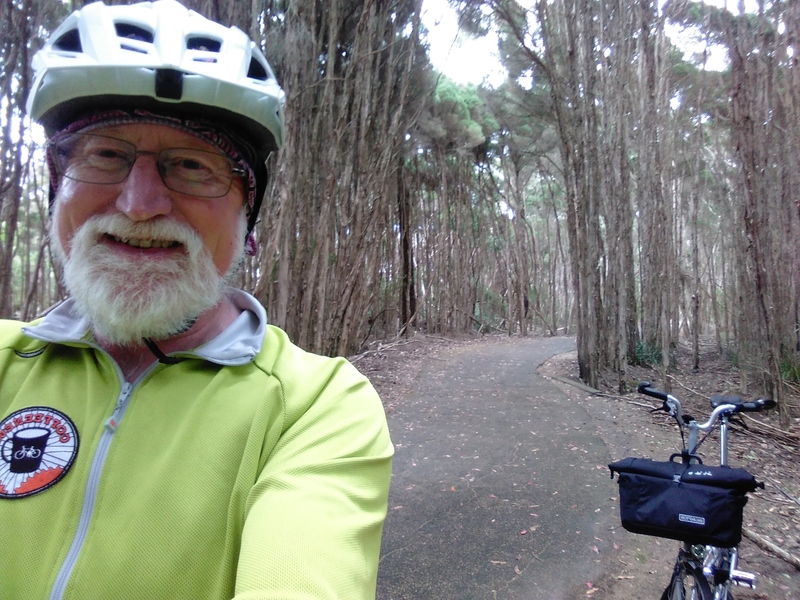 6 response to "CLC 2018 Ride #6: Into the Hills"
Great pics and I really enjoyed your breakfast! Great post, Alchemyrider. I’m really enjoying this window you’re giving us into a different corner of the world. Thank you for reading. I’m enjoying your posts too! Hi Alchemy. I was interested to see the newspaper article is in English. Is that unusual or a common thing? I am also interested as to the sort of temperature / humidity you were cycling in. I have a feeling it is at a level that would mean I would not get very far up that climb. Good morning Tony. Call me Johan. 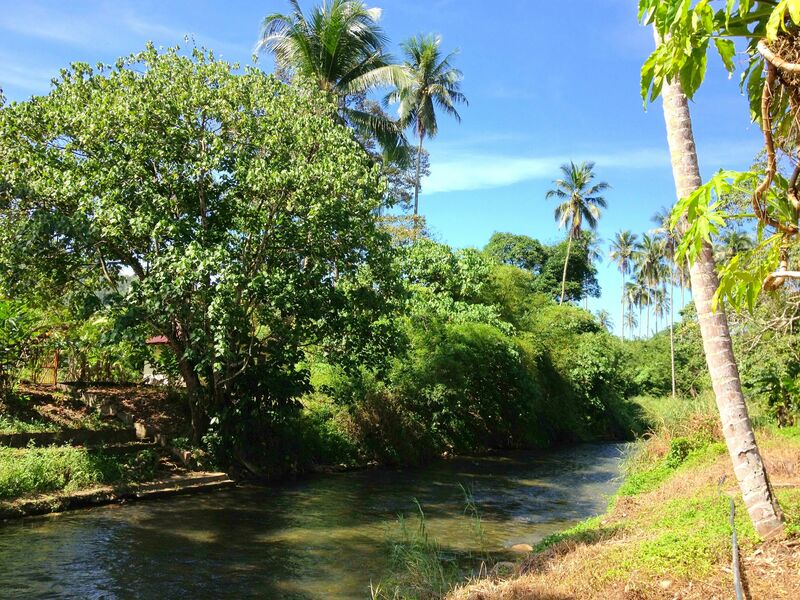 The British had a presence in the Malay peninsula since 1786. This presence gradually expanded until eventually all of Malaya, as it was then, was a Crown colony. Malaysia became independent in 1957. Hence the prevalence of the English language today. Newspapers are published in other languages too. The native population, the Malays, speak and read Bahasa Malaysia. The large ethnic Chinese population speak a variety of dialects and read Mandarin as a common language. There is also a significant Indian population, within which Tamil is the most common language. This multilingualism extends to television, radio, and cinema. All forms of media produce content catering to the four main language groups. The average annual temperatures range between 22°C and 33°C. Averages, of course, hide the outlying values. March is one of the hotter months. 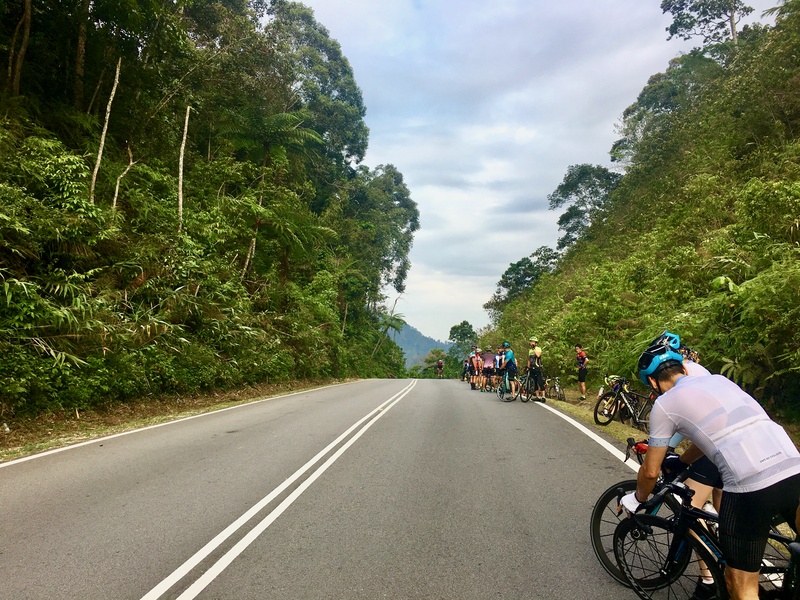 The average was 28°C with a high of 38°C during the large group ride to Morib a week ago. Yesterday it was overcast and much cooler, averaging a much more pleasant 23°C with a high of 27°C. Humidity averages 80% over the year. We’ve had a lot of rain recently. It was cooler yesterday, but the humidity was at 90%.